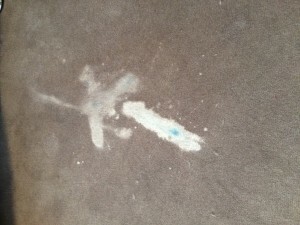 As a carpet cleaner I have seen it all, the good, the bad and the ugly…. Over the years as a carpet cleaner, I have seen some pretty funny things put on carpet to try and remove stains. Some work and some are just plain, ridiculous and cause more damage than the original stain! There is plenty of information out there about what you should put on stains of all kinds. Some of it is good advice backed up by sound scientific principals and chemistry. Some, however, is complete fiction and could quite possibly have a horror story ending rather than the “happily ever after” most people are looking for! Here are the top five home remedies to be avoided if you want a happy ending to your red wine nightmare. Why is it that whenever someone spills red wine, the first thing they do is reach for salt? This remedy has been passed down through the ages and probably had more to do with convenience than science. In the past (and present), both wine and salt were consumed with most meals. 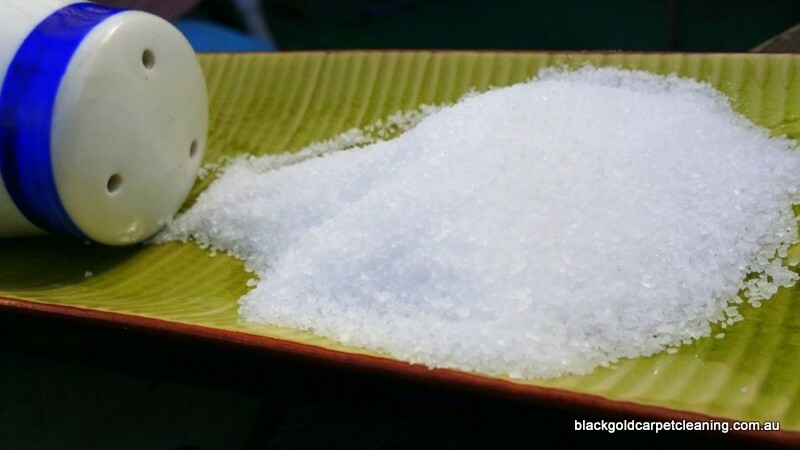 So salt was often the closest thing available to throw over a spill. The aim being to absorb as much of the liquid as possible. It sounds logical, until you consider the fact that salt is the ingredient we throw into dye baths to help bond dye to fabric fibres! By piling up a heap of salt on a wine stain, all you are doing is aiding the natural dyes in the wine to penetrate the carpet fibres. Thereby creating a permanent reminder of your clumsiness! The best first action for red wine is to absorb as much of the liquid as you can. The best way to do this is by using clean white towels or paper towels NOT salt! Do not panic – remember you can always call a professional carpet cleaner for advice. We have all heard the one about pouring white wine over a red wine spill. I believe this also comes from the fact that where there is red wine, there is usually white wine. So if you spill the red, then try to dilute it with whatever is closest and not as colourful – white wine! There is some science behind this method. Both red and white wines are acidic and acids can be used to dissolve acids. However there are lots of other ingredients in white wine as well. So white wine is probably not the best first choice when it comes to stain removal. White wine probably will not cause any further staining, however it will be a very smelly mess and not nearly as effective as some other acids which are odourless when they evaporate, e.g. white vinegar. 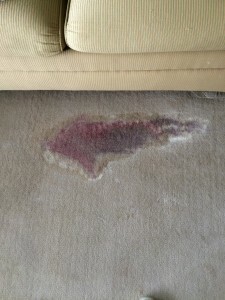 The second step when dealing with red wine stains is to dilute the remaining liquid as much as possible without causing any further damage. I would suggest adding a little cold water (preferably misted on using a spray bottle) and dabbing with a clean dry white cloth. Repeat as often as necessary until there is no more colour transfer from the stain onto the cloth. You could also try adding 1 part white vinegar to 3 parts cold water to the spray bottle. If in doubt call a professional carpet cleaner for advice! While baking soda is something that can be helpful in removing some stains, it can also leave behind a white powdery residue. This residue is very difficult to remove. I have read many blogs and articles that recommend using a a baking soda paste on food stains and pet stains. However not many mention that you also need to use an acid with the baking soda to create the right chemical reaction to remove the stains. When you combine an acid such as wine or vinegar and baking soda, you get a chemical reaction which creates carbon dioxide gas. It is this reaction that helps remove stains, the combination of a base and an acid dissolved in water. This process does work, however you have to let the paste react and then dry on the carpet. 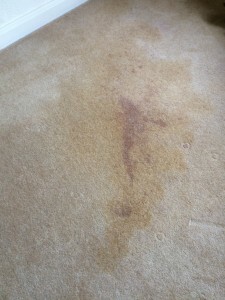 The dried paste attaches to the carpet fibres and can be very difficult to remove. Vacuuming is often not enough. You have to gently scrap the dried paste off the carpet with a blunt knife, without damaging the fibers. 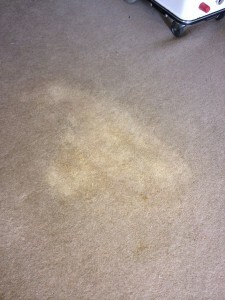 Is all the mess worth it when there are other carpet cleaner methods available that do not leave a residue? This is one of the more “out there” methods I have witnessed! Why anyone would apply corn flour to a wet carpet stain, I will never know. As with the baking soda, corn flour can be very messy and difficult to remove from carpet. Corn flour is very absorbent when it comes to greasy stains on leather furniture. This is because it is very fine and can get into tiny cracks and crevices that other products cannot. By all means use corn flour to remove grease, but don’t mix it up into a paste and lather it on your carpet. It is just too difficult to remove and there are many other remedies out there that do not require so much work! 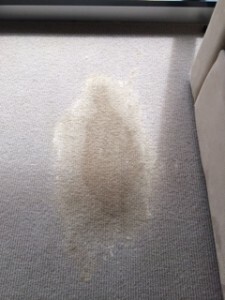 Because I am a qualified carpet cleaner, I had no trouble removing the ink stain for this customer, however the corn flour took a lot more effort! I cannot say it strongly enough – never use these products on your carpet to remove stains, until you consult a professional carpet cleaner for advice. These products often contain bleach which can remove the stains. However, unfortunately, they also often remove the colour from your carpet fibres. So you’re left with light coloured patches all over your carpet. Professional carpet cleaners also used bleach, in some situations. However we know what strength bleach to use and how to rinse it from your carpet. The longer the Vanish type products stay on your carpet, the more damage they can do. There is no easy way to rinse them out of your carpet completely, without the right carpet cleaner equipment. If the stain remains then call a professional carpet cleaner, such as Black Gold Carpet Cleaning. We can offer advice and quotes over the phone, any time, day or night!